You can remove attachments from claims. You can remove attachments if the claim has not been submitted (does not have a status of Queued, Sent, or Accepted) or rejected (has a status of ADDINF, NEARERROR, or so forth). The options for managing attachments become available. Select the All check box if you are removing all attachments from the claim, or select the check boxes of only those attachments that you want to remove. Click (or tap) Remove Selected. On the confirmation message that appears, click (or tap) OK. 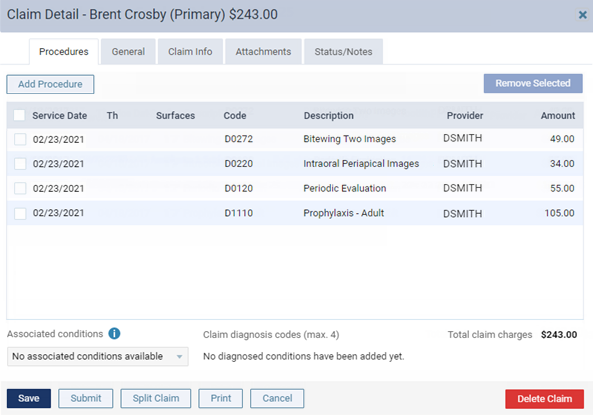 The image is removed from the claim but not the patient's document manager. Click (or tap) Print and then OK on the message that appears to create the claim as a PDF file that you can print. Use this option only if there are no electronic attachments for the claim.